ensure proper implementation of public projects, both the government, contractors and benefitting communities must work together, a non-governmental organization tracking MacArthur Foundation Universal Basic Education projects in three Kaduna local government areas, Legal Awareness for Nigerian Women, popularly known as LEADS-Nigeria has said. 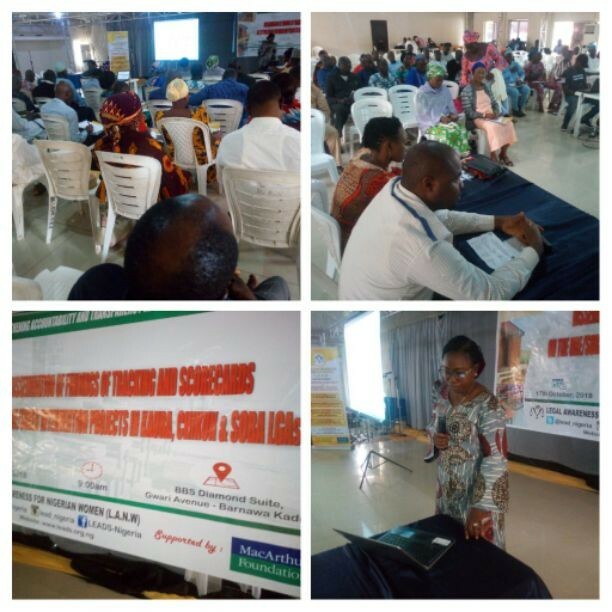 Addressing the participants on behalf of LEADS-Nigeria at the dissemination meeting on results of tracking UBE intervention projects in Chikun, Kaura and Soba LGAs, Hannatu Ahuwan said, her organization has been able to track 20 projects in one year. LEADS-Nigeria said, it had tracked 20 projects from November 2017 to October 2018 across the three LGAs as captured in its 2015 and 2016 action plans. According to Hannatu, social accountability has gained grounds as a means to more open, transparent and responsive governments, hence the need for effective collaboration among the stakeholders. To Hannatu, “citizens’ engagement makes the difference if done from a well informed and strategic manner. “In the course of our work, citizens have expressed dissatisfaction in the contracting process; some alleging that contracts were being awarded to friends and families of officeholders instead of use of due process, competitiveness and an open bidding process. “However, in its quest to make the State great again, State Government rolled out several policies to make government more responsive through citizen’s engagement and feedback. “The process of allocation, utilization and monitoring of proper utilization of UBE funds has limited participation of citizens or communities’ active participation. “Nevertheless, citizens have a right to know how public funds are used and to make input to make public service more efficient for the enhancement of the educational sector and sustainable development. “Our observations on the projects has brought to the fore the need for State Universal Basic Education Board (SUBEB) or the Local Government Education Authority( LGEA) to interface more with the communities especially during audit of schools to identify the real needs of schools and to introduce them to contractors. “It has also brought to the fore the need for contractors to be aware that as long as they are implementing projects funded by public funds, they are obligated to engage with the communities or beneficiaries to get feedback. “We have also impressed on the communities to develop cordial relationships with contractors which may influence them to engage their youths and artisans in the execution of the projects”, she added.